New tax laws give new and pre-owned boat buyers the ability to write-off their purchase when it's used for business. You may or may not have heard of Section 179 of the tax code, but it could save you a lot of money if you are considering purchasing a new or pre-owned yacht. If you are currently in the market to buy a boat, or trade-in your existing one in, the 2018 tax legislation offers substantial benefits. As long as the requirements are met, you can write off 100% of the purchase price of the yacht as a "bonus depreciation" in the year of the purchase. And even better, there is NO dollar limit on the purchase price. According to the IRS website, someone purchasing a boat can "elect to expense the cost of any section 179 property and deduct it in the year the property is placed in service. The new law increased the maximum deduction from $500,000 to $1 million. It also increased the phase-out threshold from $2 million to $2.5 million. For taxable years beginning after 2018, these amounts of $1 million and $2.5 million will be adjusted for inflation." The new legislation also covers with upgrades and improvements to the yacht you decide to purchase. Buyers can choose to upgrade electronics, add in Seakeeper gyros, paint the hull, or even re-do the teak on the deck (all of which can be done at Staten Island Marina) as long as the work is done in the same calendar year as the purchase. 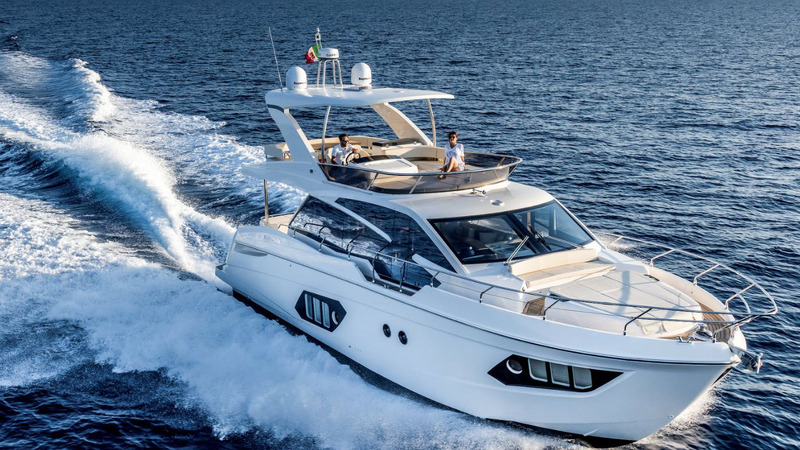 "The new tax laws definitely help make the purchase of a new or pre-owned yacht more enticing," said Frank Bongiorno, owner of SI Yachts. "We have already had several customers take advantage of the tax benefits and we want to get the word out to everyone on how to save money when buying a boat." The buyer must be an entity such as a corporation, partnership, or LLC. Frank continued, "Additionally, the write-off is not limited to the taxable income buyer's business entity. If structured the right way, the buyer may be able to generate a deductible loss from their flow-through charter business that can be used to offset their regular taxable income as long as it's done in the same year as the purchase. This really opens up a lot of opportunity to make the cost of buying a boat more affordable. We have lots of in-stock options right now as well just in time for the holidays from Viking Yachts, Princess Yachts, Prestige Yachts, Absolute, and HCB Center-Consoles." Here are 5 new and pre-owned yachts that are available now for purchase and could be written-off based on the above-mentioned tax laws. "Impromptu II" is one of the few 84' Princess Yachts that was made to US specifications! Many recent upgrades including re-painted hull & topside, new teak decks including flybridge, new AC chillers and air handlers. Custom hard glass front on flybridge. Caterpillar C-32's are up to date on service. Beautiful must-see motor yacht, do not miss this on of a kind opportunity! Our in-stock Prestige 680 features twin Volvo D-13 IPS 1200hp engines for exceptional performance. She features an interior design synonymous with light, space, ease of movement and privacy. With bold, timeless lines and high-quality materials, fit and finish, the 680 offers the same technical attributes found throughout the line, while also benefitting from the latest innovations. Oh, and her flybridge is HUGE! Designed by the Garroni Design group, the Prestige 630 impresses with the fine balance between the purity of its exterior design and the elegance of the light-filled interior. The hull design was entrusted to Michael Peters, who is among the world’s most renowned yacht designers for the performance and comfort of his hulls. The luxurious interior furnishings feature the finest materials, harmonious colors and a standard of equipment reserved for large cruising yachts. A perfect charter fishing vessel that you could use as a tax deduction, High Hook is everything you could ask for in a pre-owned Viking Convertible. Captain-maintained since new, she is in impeccable shape and is loaded with upgrades. Since 2016, she has had two Seakeeper C6 gyros installed, boat engines rebuilt by the MAN dealer, new 5-blade Veem props installed, and the bottom stripped, coated, and painted. Our in-stock HCB 53 Suenos is an excellent opportunity to own a potential charter fishing vessel and use it as a tax write-off based on the latest legislation. With unforgettable exterior styling and capability for over 2500 horsepower, this 53′ center console yacht offers performance when needed, plus agility and precision when on station or docking. The Yamaha or Seven Marine engine options not only promise to put a smile on your face each time you get behind the wheel, but the clean lines of the Suenos will sure to be the envy of all your friends. The completely retooled, ergonomically friendly helm puts everything at your reach – and no detail has been overlooked, from large touch screen navigation systems to the suspension seat pedestals for a smoother more comfortable ride. Let the Sueños take you anywhere you want to go. **Staten Island Yacht Sales is not offering tax advice. Please consult with a tax adviser or attorney to determine if your situation falls under the regulations of Section 179.